Spock was wrong, for the needs of the few outweigh the needs of the many. Allow a humble narrator to make this predicate statement, before the condemnations begin: I think Bike Lanes are both necessary and a good thing. I have no fundamental nor ideological objection to dedicated vehicle lanes reserved for human powered transportation. Friends of mine actually sit on the board of Transportation Alternatives, and although I’m not a bicycle commuter (dedicated pedestrian, me), it’s a worthy pursuit to encourage folks to get around under their own steam rather than use a motor vehicle. Saying that, there’s a lot of people who cannot get around under their own steam because… y’know, not everybody is 25 and in perfect health. 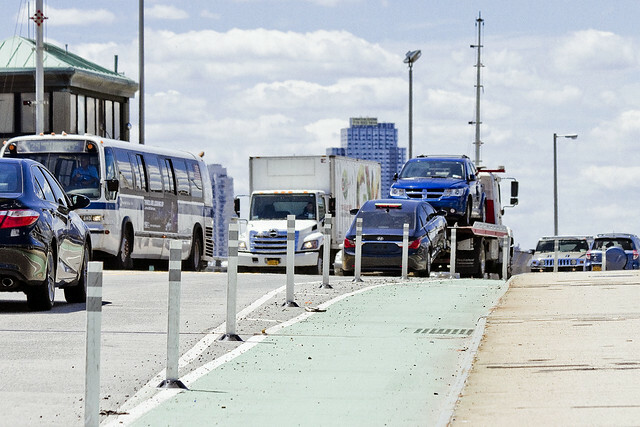 A set of bike lanes has recently appeared on the Greenpoint Avenue Bridge, which spans the currently undefended border of Brooklyn and Queens and the lugubrious waters of the fabled Newtown Creek. 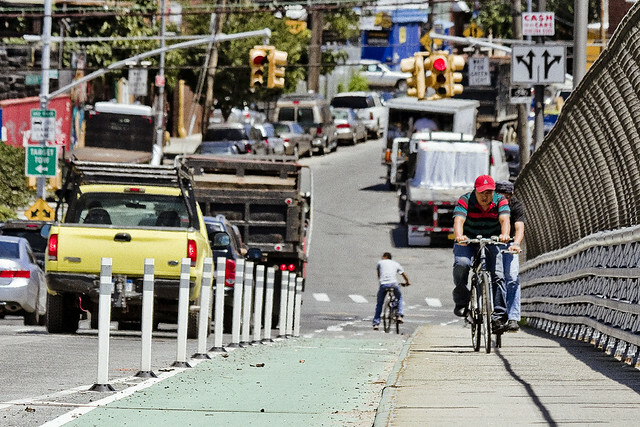 When these bike lanes opened, websites like Gothamist, Curbed, and the rest of the Brooklyn Gold Coast elites applauded the addition. The bike lanes were a personal project for some of the elected officials who I am honored to consider friends on both sides of the Creek as well. These are what is known as “protected bike lanes,” meaning that they have these little plastic bollards running along them. 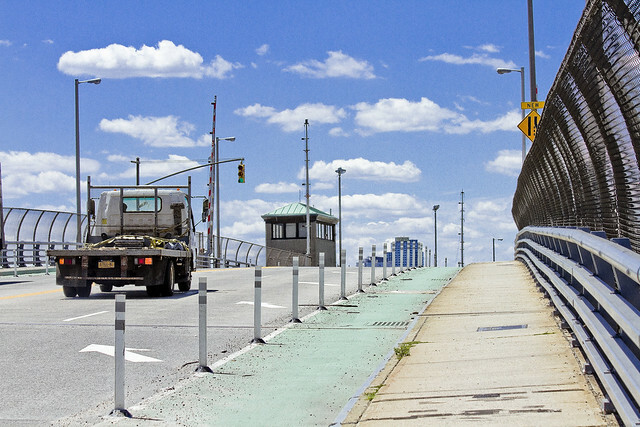 Problem here is that mid span on the bridge, which is a primary crossing between the two boroughs, the two motor vehicle lanes that cross the span on both sides now merge into a single lane. The day these shots were captured, I observed three near misses as automobiles were trying to pass heavy trucks (manufacturing zoning on both sides). The other problem is that while there are a fair number of people who bike over this bridge on a daily basis, their numbers are eclipsed by the cyclopean numbers of trucks and cars that do so as well. Several instances of southbound traffic straying into the northbound lanes were observed, and vice versa, and more than one of the heavy trucks had to jam on their air brakes to stop in time to avoid a collision. The problem, as observed, is that there are protected bike lanes for both directions of travel instead of a single dedicated path for bicycle traffic, which necessitates the 4 automotive lanes becoming two at mid span. Pictured above, you’ll notice the white auto is forcing the dump truck onto the median “no go” area as traffic merges near the center of the span. 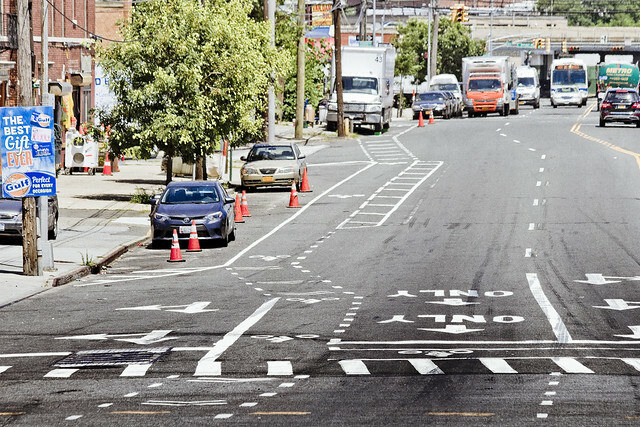 On the Queens side, the north bound bike lane terminates at a cross walk and then disappears. Just to the east of the bridge’s bike lane is an access road used by the trucks that are exiting from the recycling and waste haulage companies found along Railroad Avenue. 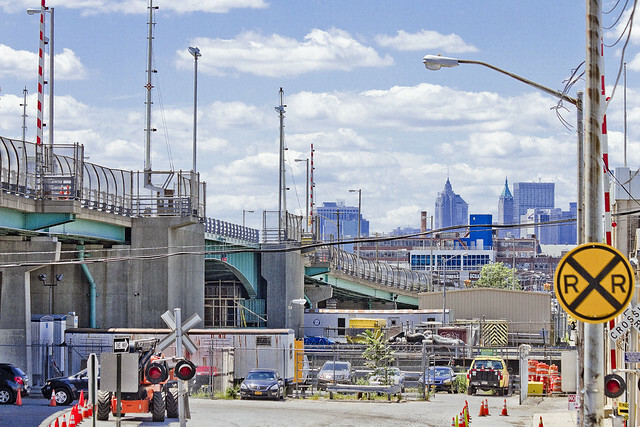 This is a high volume sort of intersection, btw, where Review and Greenpoint Avenues intersect with Van Dam Street and traffic is literally coming at you from six different directions. 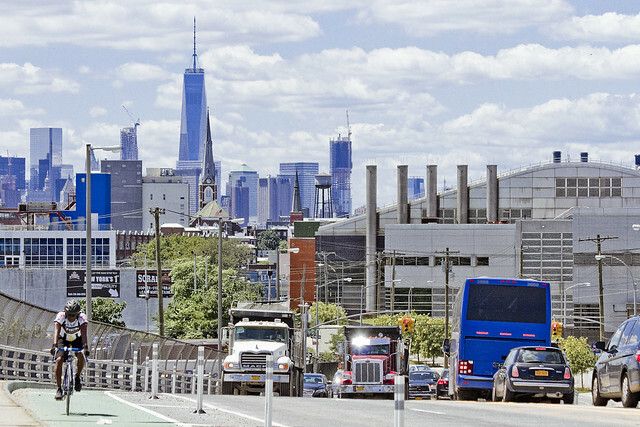 Looking up Van Dam in the general direction of Queens Plaza, the bike lane is intersected by a turn lane for trucks and other vehicular traffic. The Fed Ex truck is in that turn lane and making the left onto Review Avenue, no doubt heading for the enormous Fed Ex facility on Borden Avenue under the Long Island Expressway. Here’s a shot of the intersection which is clear of traffic, where the confusing and rather byzantine striping of the traffic indicators is fully revealed. This looks pretty dangerous to me. 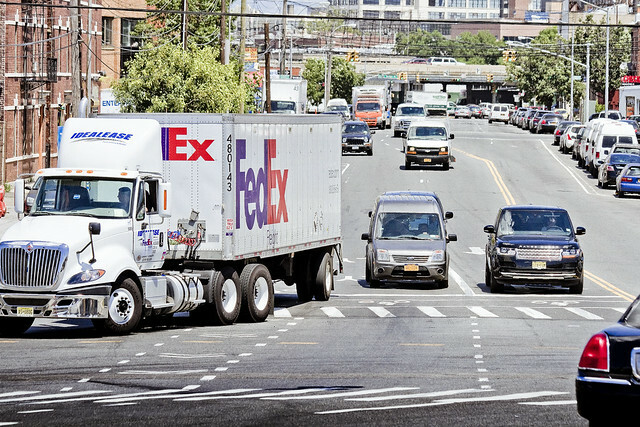 Notice that the turn lane used by the Fed Ex truck in the previous spot goes right through the bike lane which feeds the south bound lane of the Greenpoint Avenue Bridge. Funny thing is, despite all the work and expense of installing these bike lanes, and the series of vehicular hazards introduced to automotive and truck traffic by that center span merge – the bicyclists still seem to prefer using the pedestrian sidewalks – just as they’ve always done. So, now is the time for the bike people to start attacking me for pointing out that these bike lanes are imperfect and dangerous. Recriminations will include accusations of Fox News style distortion, fealty to a regressive authoritarian system dominated by motor vehicles, and the other usual character assassinations favored by the scholastic and socratic elites who occupy air conditioned offices in lower Manhattan and Downtown Brooklyn. 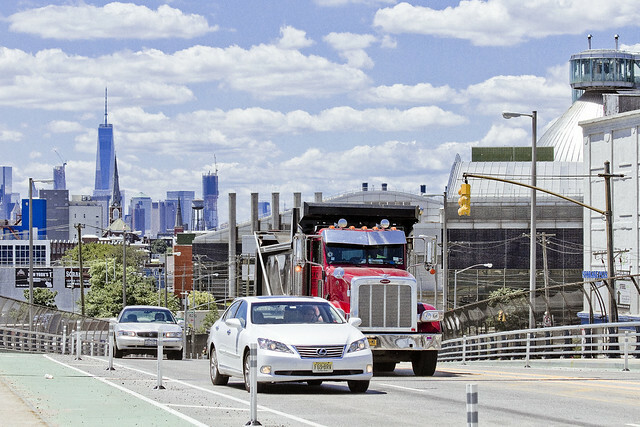 Hold your sophistry, the Greenpoint Avenue Bridge needs bike lanes, but these ain’t good. We need to do better. I’m talking to you, NYC DOT. I’m with you, Mitch, bike lanes are – in general – a good thing. Providing multiple transportation options helps spread the load and allows for choice. But as your last photo clearly shows, for the vast majority of the bike people, said bike lanes will never be enough. They seem to feel that they should have their bike lanes AND priority use of the street, AND the pedestrian lanes AND the sidewalk and that everyone else should make way for them. And woe-be-tide anyone who suggests traffic rules should be enforced with bicyclists. In the end it’s all about mutual cooperation and respect. NYC is a crowded city and all spaces are shared by multiple users who have differing needs. Problem is; most bicycle riders simply don’t have respect for anyone else and simply don’t feel that they should have to cooperate. And before cyclists responds with their tales of woe; stand at any intersection with traffic signals for an hour and see what percentage of cyclists heed those signals verses the percentage of pedestrians or motorists that heed them. And note how often cyclists blow through red lights and stop signs and crosswalks packed with pedestrians crossing legally. > stand at any intersection with traffic signals for an hour and see what percentage of cyclists heed those signals verses the percentage of pedestrians or motorists that heed them. With a lack of actual percentages it’s hard to argue with you. Some more progressive cities in the world are changing their laws to allow cyclists to pass through stop signs and red lights because it’s safer to do so. I’m not confident that your broad brush will be able to understand or believe that, however. Regardless, even if you were right, what percentage of bicyclists are causing traffic deaths vs. cars and trucks? It’s actually about 600 cyclists a day, last I heard, and agreed about the deadlier character of trucking in particular as compared to a bike strike – but it ain’t about who’s hitting who in this case – it’s about creating a dangerous set of conditions for ALL vehicular traffic on the bridge simply because it sounds good at cocktail parties. I think you miss my point, JCC. Obviously being hit by something that weighs 3,000 lbs will likely cause more injury than being hit by something that weighs 200 lbs – which, in turn, will cause more injury than not being hit at all. But hundreds of pedestrians ARE hit by cyclists every year and are injured or even killed. A friend of mine was put in the hospital for over a month when she was slammed into by a cyclist blowing through a crosswalk against the light, and then there was the women who was killed last year by a cyclist in Central Park. In the end it matters not how heavy the projectile was or whether it was a car, truck or bicycle. And it doesn’t matter who uses less energy or who is greener, or kinder or more righteous. The issue – and my point – is that the roads are shared spaces. Roads are only safe if everyone who uses them follows the rules and cooperates with everyone else who uses them. Why shouldn’t cyclists follow the rules? Why can’t they stop at a light just like motor vehicles (and just why, JCC, is it so ‘dangerous’ to cyclist to apply their brakes and put their foot down – ie: STOP – at red lights and stop signs)? Why do cyclists feel that they are deserving of special treatment (“Some more progressive cities in the world are changing their laws to allow cyclists to pass through stop signs and red lights….”)? Why do cyclists ride in pedestrian lanes and sidewalks – even when there is a bike lane available?